Infibeam.com is an exciting new online destination and community that focuses on selling cool new and used Cars, Bikes, Scooters, Mopeds, Mobile Phones, Mobile Accessories, Books, Cameras, Watches, Health Equipments, Cakes, Chocolates, Flowers, Combo Gifts and much more at best price. Visit http://www.infibeam.com. Use the top header to browse the product you want to buy. Product Detail Page: On the product detail page, pick appropriate product options and click on "Add To Cart". If you want to buy any other products repeat above steps. Click on "Proceed To Checkout" to start your purchase. Enter a gift message, processing instructions and pick a delivery date. Enter / Select a shipping address. Enter your GC code in the light green box "Enter Promotion/Gift Certificate Code". Click on "Apply" next to the box. A light blue coloured box will appear with the GC amount applied to your order. If the GC amount is equal to or greater than the amount you are trying to purchase, click on "Go" button. Your purchase is complete. If the GC amount is less than the amount you are trying to purchase, you will see payment options on same page. Select a payment option. You will be taken to a payment gateway where you can enter your payment details to complete the purchase. You need to enter your GC code only once.Once you enter the code and click on Apply, a GC account is created for you and the amount is added to this account.Whenever you try to purchase on Infibeam.com, if you have any GC balance a light blue coloured box titled "Infibeam.com Gift Certificates [Available Balance = XYZ Rs.]" will appear on the Make Payment page. You can click on "Apply" button next to the GC balance to your order. Infibeam.com is an exciting new online destination and community that focuses on selling cool new and used Cars, Bikes, Scooters, Mopeds, Mobile Phones, Mobile Accessories, Books, Cameras, Watches, Health Equipments, Cakes, Chocolates, Flowers, Combo Gifts and much more at best price. Steps to Redeem Infibeam.com Gift Certificate Visit http://www.infibeam.com. Use the top header to browse the product you want to buy. Product Detail Page: On the product detail page, pick appropriate product options and click on "Add To Cart". Shopping Cart Page: If you want to buy any other products repeat above steps. Click on "Proceed To Checkout" to start your purchase. Shipping Details Page: Enter a gift message, processing instructions and pick a delivery date. Enter / Select a shipping address. Click on "Make Payment" button. Payment Details Page: Enter your GC code in the light green box "Enter Promotion/Gift Certificate Code". Click on "Apply" next to the box. A light blue coloured box will appear with the GC amount applied to your order. If the GC amount is equal to or greater than the amount you are trying to purchase, click on "Go" button. Your purchase is complete. If the GC amount is less than the amount you are trying to purchase, you will see payment options on same page. Select a payment option. You will be taken to a payment gateway where you can enter your payment details to complete the purchase. Note: You need to enter your GC code only once.Once you enter the code and click on Apply, a GC account is created for you and the amount is added to this account.Whenever you try to purchase on Infibeam.com, if you have any GC balance a light blue coloured box titled "Infibeam.com Gift Certificates [Available Balance = XYZ Rs.]" will appear on the Make Payment page. You can click on "Apply" button next to the GC balance to your order. This Gift voucher cannot be exchanged for cash or cheque. The holder of this Gift voucher is deemed to be the beneficiary. The full amount of gift voucher can be applied to only one account on Infibeam.com. 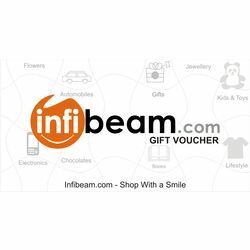 This Gift voucher can be redeemed only on infibeam.com. A hard copy of the gift voucher will be mailed to the receiver. We can send the gift code by email to sender / receiver on request from sender, after processing of order is completed. Gift voucher are valid for 6 months from the date of purchase.